Splitska apartments accommodation in Splitska island Brac Croatia info and rates. Ukoliko imate apartmane i zelite ih ovdje oglasavati molim posaljite nam poruku na info@zlatni-bol.com. 1. Villa Anna in Splitska. A small gentle cove surrounded by cultivated pines, and situated on the road between Supetar and Postira. Splitska is a valuable monument of environmental mediterranean architecture. Splitska cove offers a possibilities for secure putting to shore for sailing ships and other boats. Rocky coast offers a nice places for sunbathe. The sea is limpid and clear and the pine trees leans over, to the sea. 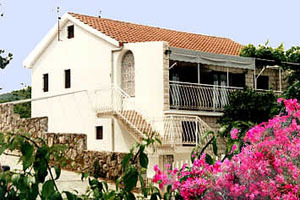 Apartment house ANNA is situated on the way from Splitska toward Postira. House ANNA offers 4 apartments for 3-6 persons, each one with bathroom and kitchen, balcony and terrace with the view at the sea. All apartments are well equipped and all are categorized with three stars. Prices for apartment are from 40 till 80EUR/night.